Kayaking is great. Storing and transporting a kayak? Not so much. Until Oru Kayak. 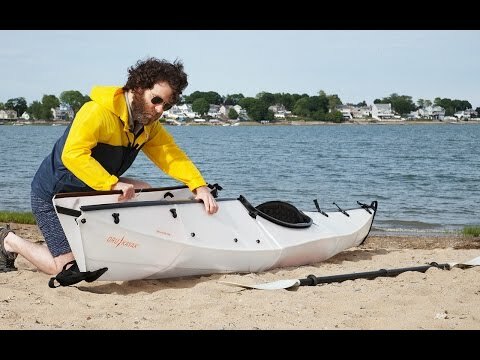 Oru Kayak, the original foldable kayak, is lightweight. Made from a single seamless sheet of double-sided polypropylene, this one-person boat can be easily put together in 5 minutes, and folded back up in half that time. This kayak is made for calmer, sheltered waters. It folds up into a compact case that fits in your car's trunk or a closet back home. Founder Anton Willis grew up kayaking but was living in an apartment too small for his hobby. While reading an article on origami, he had an epiphany: what if you could fold your boat like paper? Several years and dozens of prototypes later, Anton's team manufactures the boats right in California; all the parts are sourced in the USA, too. 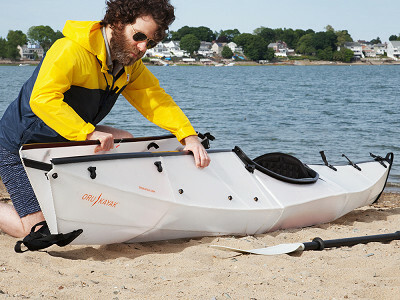 Oru Kayak is easy to tote, fold, and ride. Suddenly, storage and portage aren't an issue with kayaks anymore. Hi everyone! We are pleased to bring Oru Kayaks to The Grommet today. Please let me know of any questions you have. You can see a few I answered below. Personally, if I lived in an apartment and wanted to go kayaking I would just resign myself to the fact that it wasn't going to happen. What made you want to take the plunge in creating this as a business? 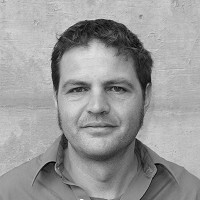 @Mike Anton (inventor) is a problem solver and a curious mind. When you combine that with his incredible intellect, you have the potential to resolve almost any problem. Once the product reached a certain state, it became apparent that this kayak needed to happen. The question was how...so we launched a Kickstarter Campaign in 2012, sold nearly 500 kayaks in a month and we were off! @Mike What is the difference between the Bay and the Bay+? The Bay+ has premium features. Mechanical assist buckles, a day hatch and a higher seat back. And here is a video of someone beating it with a hammer to show its durability. Humming Hammer Time while watching is optional. How steady is the kayak in water (how easily does it roll, how choppy can the water be)? Although I am a disabled senior and have never been kayaking, I just want o applaud you for your ingenuity! May I ask, how did you find out about the polypropylene material and it's ability to fold? Your design is brilliant. Good luck to you in your new business venture! @Ann Thank you for your kind words! @Roberto I am a kayaker, and I find this to be genius! I wish I knew about this before I bought my kayak. But I love mine too! Good luck! What is the difference in the Bay $1,275 and The Bay+ $1,575? @Paula The Bay+ has premium features. Mechanical assist buckles, a day hatch and a higher seat back. How much does the kayak weigh? I am concerned about carrying it. @Sheryl Awesome! Glad that sorted itself out :) let us know if you have any further questions— happy to help. Hello and how funny this is to find your product on Grommet. I have tried to connect with you through customer service n your website for several weeks. YOU do not seem to have anyone that answers the phone. My son is an outdoors major at Alaska Pacific University. WE inadvertently recycled the box the kayak came in and I am trying to get a new box for him to ship the kayak to Alaska. Unfortunately, your customer service seems unable to reply back.Makes me worry about customer service on something really imprtant regarding your product. @kate Hi Kate, sorry for the delay, we actually just got your first email to [email protected] 20 minutes ago. The boxes we use to ship the kayaks are custom made. I'll answer on the email you sent to [email protected] though :) thanks for reaching out! Since utube does not seem to be working on my IPad for some reason is there any other way to access information about this kayak? @Ruth If you click on the pictures underneath the video, you will see more detailed info about each kayak. Also, you can watch the videos through the page. Those should help answer questions as well! @Tom Hi there! As long as it's stored away from a direct heat source and not left out exposed to the elements, there should be no problem. That said, we suggest not using or folding the Oru in air temps below freezing. @Roberto This is an interesting point in re the comment by Kate (7/2 @ 12:47p) that her son wants a replacement box to ship it to Alaska, where he attends school! Having never been to Alaska, I can not speak from experience, but I suspect the temps there do go below freezing ;—), and your comment here, tho not mentioned in your response to her, is that "...we suggest not using or folding the Oru in air temps below freezing." Hope he wasn't planning to do so. Maybe "summers" in Alaska are above freezing for long enough to be able to use the Oru. Side note: Do you have a statement printed on your box suggesting the box be saved for storage or shipping convenience (for those who can't figure that out on their own;—) ?? And you're right, it tends to get chilly in Alaska so you should use with caution, but as of this typing it is a balmy 56 degrees in Anchorage! Hi Law, as Mike mentioned already, there's is no warning printed on the box, but if you're planning on possibly shipping your kayak at some point, then saving the box would definitely be a great idea. That said, it can easily be shipped in the Oru Pack as well. About paddling in extremely cold temps, we suggest avoiding folding/unfolding if temp is below freezing, but we do have Oru Kayakers in the Nordic countries paddling it year-round! Here's a video one shared with us— you can hear the ice cracking under the Oru as he paddles across. what about the paddle- does it fold, also? sorry- just found the answer to that! @m Doesn't fold, but does break down into 4 parts and can also fit in the folded kayak! @Roberto Very awesome idea, i shared this with some of my friends, hopefully some of them get one...Next you should make a collapsible hang glider. @Ryan Thanks for helping us spread the word Ryan, hope to see you guys in an Oru Kayak soon! Sorry to be naive about this, but you'll need to explain a bit better about the difference between the two kayaks...I don't know what mechanical assist buckles and a day hatch are! I would be a brand new kayaker....would it be too tippy for me? @Suzanne Happy to elaborate :) The Bay+ has ratchet buckles (same as the ones usually used for ski boots, so they're easy to tighten), whereas the Bay has plastic buckles similar to those used for backpacks which you tighten by pulling on the strap. The day hatch is a water resistant compartment where you can store your keys, wallet— any small items you'd like to keep at hand while paddling. Regarding stability, it's a great boat for first time kayakers and seasoned paddlers alike! Seasoned paddlers might find it a bit tippier at first, since it's more responsive than heavier kayaks that they might be used to, but for brand new kayakers like you, you won't feel that difference at all :) it'll just take a minute or two to relax into it. It's a very stable and fun boat to paddle. I have minor back issues that irritates me when hunched over for extended periods of time, so I would require excellent back support. When I cycle indoors, I use a recumbent bike. I'm thinking I may get into kayaking to spend more time outdoors. I'm very new to kayaking, but athletic so I'm not worried about balance. However, in your opinion, how is the comfort compared to a "standard" kayak? It appears the Bay+ has a higher back, I would assume this would be ideal for my situation? @Robert The Bay+ does have a fully adjustable backrest that provides great back support— so this would be a great option for you. Hi Roberto: fantabulous idea! I live in Nova Scotia, Canada and having a kayak that travels is incredibly appealing. Does this kayak work well as a sea kayak? I don't go into very bad weather or significant waves but choppy waters will occur. I couldn't tell if there was a skirt. Any chance a two-person is in the works? @Marie Thanks for the kind words! The Bay does work well in choppy waters, and we've just added the Coast kayak to our product line— a longer, faster and even more stable boat, which could also be a great option. We do have a skirt available for pre-order too and we definitely suggest getting one if you know you'll be getting into rougher surf or practicing some rolls! A tandem kayak is definitely something we're considering, and we're hoping to add one to our product line as we continue to grow. Wonderful, brilliant idea!!! My husband and I have resisted buying our own kayaks for years because of transport issues -- we love kayaking mountain lakes but did not want to have to buy a trailer or load/unload them from the top of a car carrier. For a technically challenged individual like my husband, I'm afraid I would have to be the one folding/unfolding them though! Fantastic idea... I wish you the best! Was disappointed that the Sharks didn't invest in the Oru. Hope you succeed. @Cyndy Thanks Cindy! We did get an offer by one of the Sharks. Hope to see you in an Oru Kayak soon. @Roberto: I missed that episode of Shark Tank. Am curious about their 'assessments' of your product, and what made you decline whatever that Shark's offer was? Sounds like you're progressing well without it, and not having to surrender a chunk of ownership and/or control!! Were you introducing this product on Shark Tank? If so, I saw you and I LOVE it! If I had the extra $1,575 I would purchase it in a minute! Love it. Good luck to you. Brilliant idea! @Tammy Thanks for the support Tammy! We also have the original Bay kayak at a sweet $1,275. Looking forward to having you paddling an Oru soon. I have actually been looking for a kayak, and I want to buy this, but I'm not sure I can because of the price. I may be able to purchase this at a future date! Hi Evan, totally understandable! We hope to see you soon! @Mike Thanks for the support Evan— looking forward to having you in an Oru Kayak soon. Happy paddling! That does sound awesome! We'll keep it in mind :) We do hope to be able to add different color options as we continue to grow— stay tuned! What kind of longevity do you propose that this product have...and by that, I mean how many times can you fold/unfold before you need to replace this? Great question. The material is rated for 20,000 fold cycles— that's lot of kayaking adventures! I like to fish, is this a kayak that a fisherman can use and how? We do have a lot of Oru Kayakers fishing with their kayaks and, thanks to one of them, we have added instructions in our Help Center on how to install a fishing rod holder to the Oru. Kayaking is great. Storing and transporting a kayak? Not so much. Until Oru Kayak. 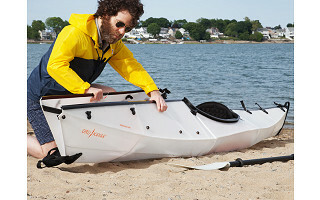 Oru Kayak, the original foldable kayak, is lightweight. Made from a single seamless sheet of double-sided polypropylene, this one-person boat can be easily put together in 5 minutes, and folded back up in half that time. This kayak is made for calmer, sheltered waters. It folds up into a compact case that fits in your car's trunk or a closet back home.